Located in the Pacific Ocean are a number of circular currents that run several thousand miles wide and are known as the North Pacific Gyre. Most vessels making the journey between the mainland United States and Hawaii typically try to avoid this high-pressure system in the central Pacific Ocean because the water lacks the nutrients necessary for fruitful fishing and it lacks the wind needed to propel vessels relying on the winds power to thrust them across the ocean. Tossing garbage into the ocean is nothing new. Garbage not tossed directly in the ocean has a way of ending up there via the flow from storm drains and rivers that empty into bays and oceans. Plastic bags and other types of plastic trash tend to be very lightweight and are easily carried by wind. Items can be plucked from garbage cans or landfills so even something that was disposed of properly can end up as litter. Once deposited into lakes, streams, canals, or other bodies of water the plastic is weighed down and resumes its travel by water. Water flows towards oceans, so sooner or later trash from landlocked areas can end up in the ocean. The problem of litter has become more intensified over the last 50 years or so as we have developed more durable trash. As manufacturers concern themselves with sealing in the freshness and wrapping individual or travel size servings of food and beverages the influx of durable packaging has begun to take root. Paper and biodegradable rubbish will break down early into their oceanic travels thinning out the heard a bit. Most metals will rust and fall apart, and glass may smash if roughly jostled, these smaller pieces and fragments are prone to sinking, if not completely to the bottom, at least deeper into the murk of the Great Pacific Garbage Patch. Heavier items usually do not make it out too far because they sink pretty quickly. Non-plastic trash is nothing to be taken lightly, but since plastic makes up the overwhelming majority of the Patch it draws most of the focus. Since plastic does not breakdown and is naturally buoyant the Patch features a heavy concentration of plastic products, mostly bags, bottles, hangers, nets and fishing lines constructed from polypropylene, as well as similar items. Many researchers believe the Great Pacific Garbage Patch is the largest garbage dump in the world. The term patch may be misleading since it has been estimated that this Garbage Patch is larger than the state of Texas. It is unknown just how deep the Patch dips below the surface. There is definitely rubbish suspended at varying depths and it is safe to assume the trash extends all the way to the ocean floor. Areas below the Gyre are some of the deepest in the Pacific. These facts can be staggering, but it helps define the true size and impact of the Garbage Patch. The process of biodegrading is really a process of bacteria eating away at a material, whether it be paper or some type of carbon based substance. A bacterium that eats away at plastic has yet to be discovered, so unfortunately by this stage it is safe to say such a bacterium does not exist. Some types of plastic become brittle and break apart over time and under the right conditions, but breaking into smaller pieces is not the same as breaking down. When exposed to water and sunlight some types of plastic may break into smaller pieces, these small pieces still retain the plastic polymers of the original larger piece of plastic – it is the same thing just smaller. By comparison, when organic matter breaks down the chemical compound is altered. What was once paper is no longer paper, the broken down substance retains a similar, but not identical composition. Over time the plastic garbage breaks apart into finer and finer particles. These small plastic fragments contribute to the thick, soup that is the Great Pacific Garbage Patch. When people think of the dangers posed to marine animals due to litter, the common images that come to mind are those of animals tangled in plastic bags or misguidedly eating trash. These are real and serious problems. An animal entangled in plastic bags, rope, nets, or other debris cannot escape predators. This turn of events can throw nature of course and may lead to additional problems. When animals consume plastic garbage either the rubbish can become entangled in the animal’s digestive system and lead to death, or since the material cannot be digested it takes up space in the stomach, giving the animal a false sense of being full while they starve to death due to a lack of nutrients. These are horrible and painful ways for animals to die and the only reason it happens is because people are lazy and do not properly dispose of their trash. When animals die due to consuming trash the garbage is still not out of the mix. As the carcass decomposes the plastic litter is once again revealed and goes right back to where it left off breaking apart into smaller pieces and confusing animals into thinking it is a food source. Japanese scientists have found other ways plastic harms not only marine animals, but also those further up the food chain. The small plastic bits that result when disposable plastic bags and bottles are exposed to water and sunlight accumulate hydrophobic, which are non-water-soluble-toxic chemicals. Plastic fragments absorb DDT, PCBs, and other oily pollutants. Since these tiny plastic particles float about in the water they are more likely to be consumed by marine life, like zooplankton or jelly fish. Once consumed the organism may become ill or die, or it may be consumed by an animal further up the food chain and the harmful pollutants will be passed on. The predator will possibly fall ill or die, or if consumed the pollutant-laced plastic particles will be passed along, again. This is an alarming and scary turn of events, but what is even more concerning is that humans are at the top of the food chain. While there is a sense of things coming full circle if humans fall ill as a result of their own careless act of littering, irreparable damage can be caused to delicate ecosystems and innocents will be harmed in the process. It is hard to measure the extent of the damage, largely because the Great Pacific Garbage Patch is constantly in motion due to the gyre of currents. The trash is moved and flows with the water, large pieces break apart, some materials break down and everything is constantly in motion. Another substantial challenge to quantifying the degree of harm is the sheer vastness of the area. The amount of manpower and finances necessary to assess the problem is just beyond what any country or organization can afford to put up, and since the Garbage Patch is located in an out of the way area of the planet the notion of out of sight, out of mind plays a role in minimizing the awareness and sense of ownership of the problem. It may be too difficult to completely fix the problem, but it is not too late to change the tide, in a figurative sense. Cutting the problem off at the source will prevent the problem from growing larger. Undoing the damage that has already been done may be prohibitively expensive. Cleanup efforts may also require interfering with delicate ecosystems and this could pose the question is it worse to leave the litter where it is or is it worse to disturb and possibly damage an ecosystem by removing garbage. When you trace back the source of the problem is litter, predominately plastic litter. Giving up your disposable plastic habit and switching to reusable products will limit the amount of trash that finds its way into the ocean. Reusable shopping bags are a more durable alternative to disposable plastic bags which are a main culprit in the battle against litter. Reusable bags are sturdy and designed to hold more than their disposable counterparts, so you will need fewer bags to carry the same amount of groceries. It is estimated that one reusable grocery bag will eliminate the need for about 600 plastic bags a year. This simple switch eliminates the need and use of millions of plastic bags and that will mean fewer plastic bags will end up as litter and will end up contributing to the Great Pacific Garbage Patch. 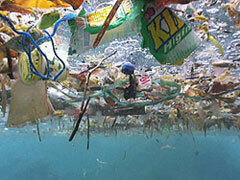 To learn more about the Great Pacific Garbage Patch go to http://discovermagazine.com/2008/jul/10-the-worlds-largest-dump and http://science.howstuffworks.com/environmental/earth/oceanography/great-pacific-garbage-patch.htm. What’s The Problem with Disposable Plastic Bags Anyway?